The Mexico City chapter is divided into four parts. 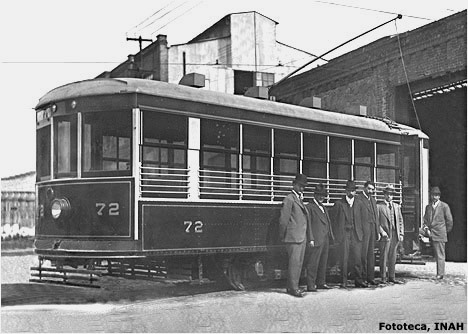 Mexico Tramways Co. continued to construct vehicles at its Indianilla shops, not only for the capital but also for tramway systems in other cities. 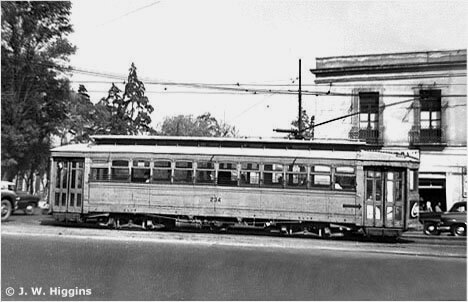 In 1921-22 it built nine large cars for Guadalajara. 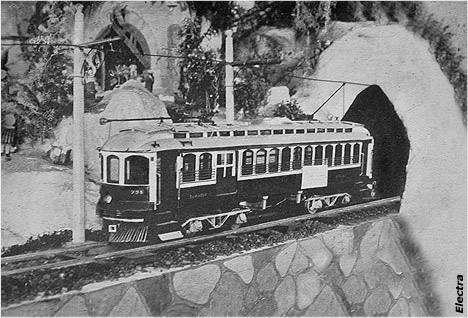 The mysterious vehicles that opened the electric tramway in Puebla in 1924 probably also came from Indianilla; its 10-km route to Cholula was part of a 162-km interurban line planned in 1909 [see Part 2]. 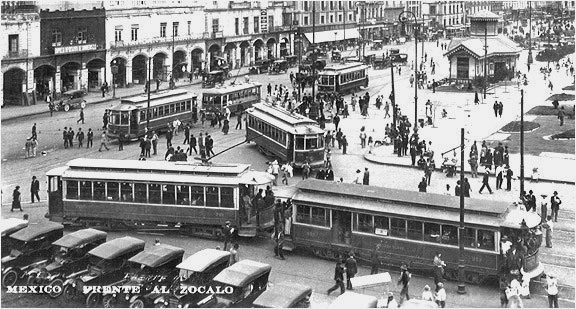 Mexico City's tramway system reached its peak in the 1920s. The November 1925 edition of Electra, MTC's monthly magazine [see BIBLIOGRAPHY], reported 321 passenger motor cars, 20 single-truck passenger trailers, 82 double-truck passenger trailers, 43 freight motor cars, 60 freight trailers, 29 funeral motor cars, 27 funeral trailers and four "special" cars running on 348.61 km of track. The company had 4,012 employees. The rest of the photographs on this page were taken after World War 2, even though the vehicles were built many years earlier. They are presented in the order of their fleet numbers, which is not necessarily the order in which they were built. 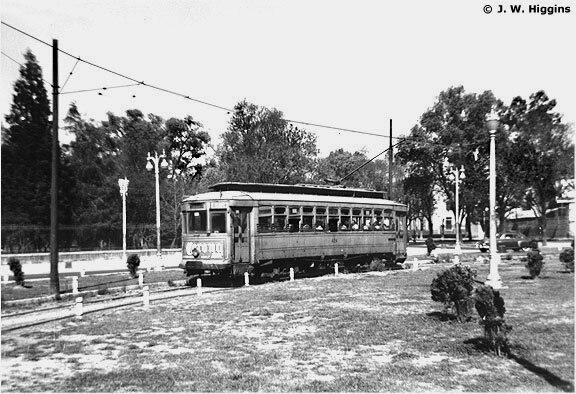 The Guadalajara page of this website has a photograph of tram 243, one of nine built by Mexico Tramways Co. for Guadalajara in 1922. 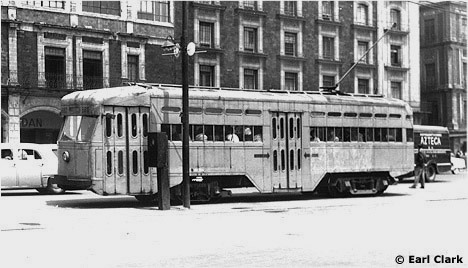 When the Guadalajara system closed in 1944, cars 241-249 returned to Mexico City, where they ran another dozen years. So much for the rolling stock in the 1950s [see also Part 4]. Abandonment of the tramway lines began in the 1930s. 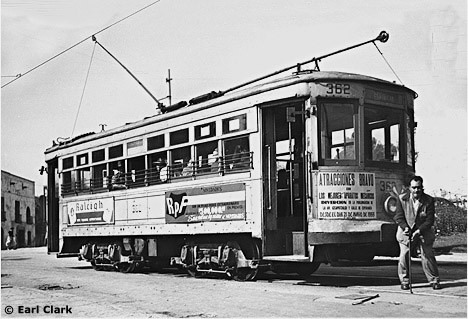 MTC closed its Granada route, the last animal-powered tramway in the Federal District, in 1932 [see Part 1 and milestones map]. In 1934 it closed the Tulyehualco line beyond San Gregorio and the gasoline-powered tramway from Azcapotzalco to Tlalnepantla [see area map]. More closures followed World War 2 [see Part 4]. Friction between the Canadian company and its Mexican employees had been festering since the 1920s and the latter finally struck for higher wages in February 1945. The government accused Mexico Tramways Company of poor service and broken contracts, confiscated its property and formed a new agency, Servicio de Transportes Urbanos y Suburbanos, to run the cars. The latter was reorganized as Servicio de Transportes Eléctricos in 1947 but MTC did not give up control completely until 25 January 1952. 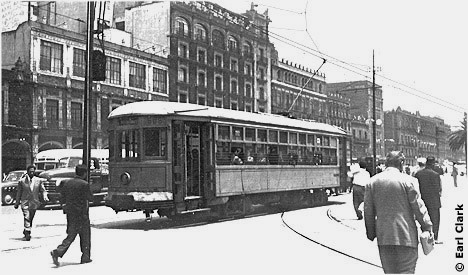 The Departamento del Distrito Federal finally purchased the assets of the Canadian company for 13,975,000 pesos and STE still operates the trams and trolleybuses in the Federal District today [see Part 4]. 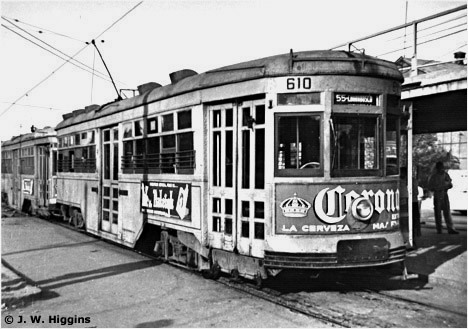 Mexico Tramways Company. Mechanical Department. Replacement Cost Estimate of Each Type Car to Include Entire New Equipment [sic]. Mexico City, 22/7/1922. Chart supplies financial data and fleet numbers of 573 trams of 48 types. Mexico Tramways Company / Mexican Light & Power Company. Plan of Mexico City. México, 10/1923. Detailed street map with track layout of entire tramway system, including Tlalnepantla, La Venta and Tulyehualco lines. 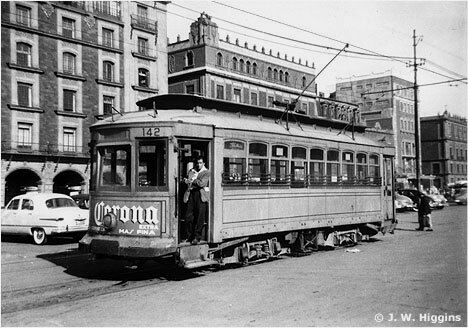 [Mexico Tramways Company.] Recapitulation and Summary: Car Equipment Data. Mexico City, 26/11/1924. "Sheet Twelve" notes fleet number, builder, construction and reconstruction dates, measurements and data on trucks, brakes and electrical equipment of every tram in fleet. 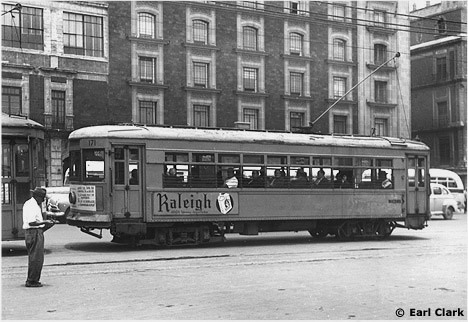 "Front Entrance Center Exit Cars for Mexico City" in Brill Magazine (Philadelphia) 11/1924, pp. 205-207. Description, diagrams and photographs of the new model. "Los Grandes Servicios Públicos de México" in Electra (México), 11/1925, pp. 28-29. 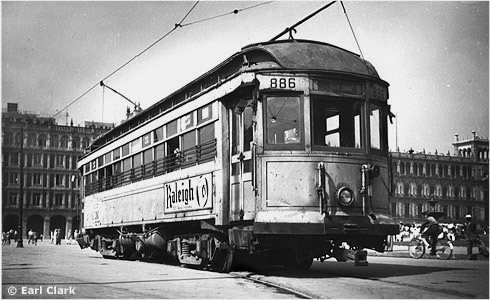 Concise history with six interesting photographs and data on current tram fleet. "Treinta Nuevos Carros de Pasajeros Serán Puestos en Servicio" in Electra (México), 4/1928, pp. 19-20. Nice article with text and diagram of the new Brill trams. "Thirty More Cars for Mexico City" in Electric Railway Journal (New York), 12/5/1928, p. 795. 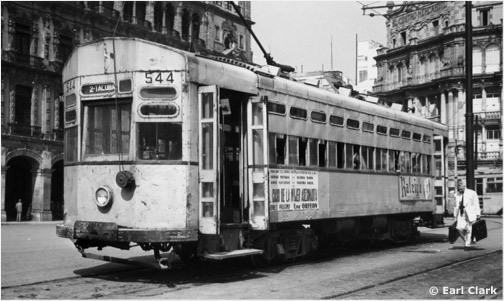 Photo, diagram and stats of the last trams that Brill built for Mexico. "Historia del Servicio de Tranvías" in Electra (México), 5/1929, pp. 4-5. Brief summary with two photos. "En 37 Años, los Tranvías e México han Transportado a Cinco Generaciones" in Electra (México), 9/1929, pp. 6-7. Nice résumé with descriptions of the Tulyehualco, Coyoacán, La Venta, Ixtapalapa and Azcapotzalco lines. Electra (México), 12/1930 pp. 9 & 16, and 1/1931 p. 16. Untitled news items about model trams built by employees. Source of the fifth photo above. Guía América. Carta General de la Ciudad de México. México, 1933. Large street map shows tram routes from Mixcoac to Villa de Guadalupe. Compañía Mexicana de Luz y Fuerza Motriz / Compañía de Tranvías de México. [No title.] México, . Unnamed, undated street map of Mexico City shows track detail for tram lines between Mixcoac and Villa de Guadalupe. Realistic; not stylized like the 1932 map above. Information seems to be from late 1935. Jorge Joseph. "Los Tranvías en México: Su Historia y su Problema" in Hoy (México), 20/1/1945, pp. 62-66. Nice survey in news magazine - on the eve of nationalization. Eleven photographs from the Archivo Casasola. T, Philip Terry. Terry's Guide to Mexico. Boston, 1947. "Tramways" section on pp. 530-532 lists 19 Urban Lines, 8 Suburban Lines and 8 Shuttle Lines. "Death Toll in Trolley-Car Collision in Mexico Passes 60, With 90 Injured" in New York Times (New York), 23/2/1953, p. 1. Article and large photo of the disaster on the La Venta line. Laurence Veysey, Raymond DeGroote, J. W. Higgins, Herman Rinke et al. 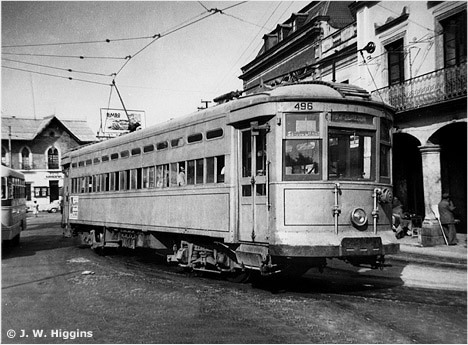 "The Street Railways of Mexico City" in ERA Headlights (Hoboken, NJ), 5 and 6/ 1955. Superb survey with text, 18 photographs, 2 maps and a detailed car roster based on official company lists. Glen D. Bottoms & Luis León Torrealba. "Mexico, D.F. Where Tramlines Are Still Being Built" in ERA Headlights (Hoboken, NJ), 7/1974, pp, 1-7. 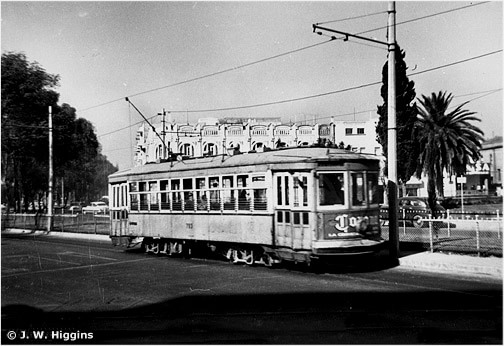 Nice article with 2-page map (showing tram and metro lines) and 13 excellent photographs. Martin Jenkins. 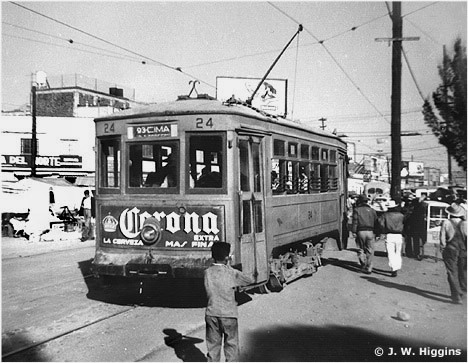 "The Tramways of Mexico. Part 1: Mexico City" in Modern Tramway (London), 7/1974, pp. 232-241. A major survey with map (showing tram, trolleybus, metro and railroad lines), charts and six photographs. Excellent detail on route development (and closures) and the car fleet. Gabriel Esparza Velázquez, ed. 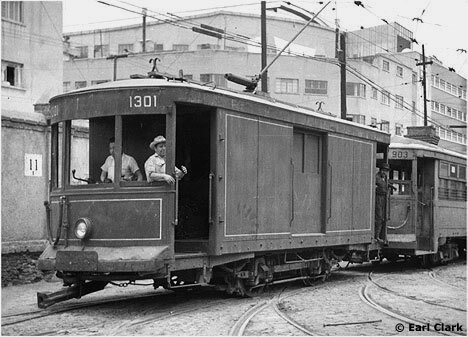 Los 101 Años del Transporte Eléctrico en la ciudad de México. México, 2001. Joel Álvarez de la Borda, Javier Lazarín Guillén & David Luvín Guzmán Pérez. Ciento un años de Transporte Eléctrico en la Ciudad de México. Index page of the Internet version of the printed text above: 12 chapters, dozens of pages, maps, photographs and other illustrations. Manuel Aguirre Botello. Los Tranvías de la Ciudad de México, 1850-1971. This website - under construction - will provide a complete survey of tramway development in Mexico City. The map of the Rutas de Tranvía de la Ciudad de México, 1930-1950 is an extraordinary document. Pass the cursor over a route name on the list and the route lights up!